Still a relative newcomer to the European and North American coffee scene, the Flat White is not, and should never be called a 'small latte'. It's a much more precise coffee than a standard caffe latte, which is likely why it's achieved an almost cult-like status to baristas worldwide. Some report that the name “flat white” was coined in Sydney during the early 1980s. But Melbourne has also attempted to claim the name, stating it was actually being made earlier, in the 1970s. And New Zealand's baristas have also weighed in, stating that the modern form of the drink was developed in Wellington during the late 1980s. We’d argue that both nations have had a hand in developing the identity of the drink, with flat whites eventually taking hold in the UK during the mid-noughties. Where a number of independent firms began to offer flat white coffee, with one or two shops even taking it as its name. As for this intricate little coffee itself; the process of producing a flat white coffee is relatively simple — and involves steaming milk and pouring the resultant microfoam over a single or double espresso. 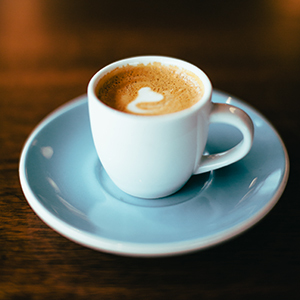 Many would argue that to be considered a flat white, you must serve the micro-foamed milk over a double espresso, but with many coffee shops and cafes offering single shot espresso versions, it’s abundantly clear that on average the coffee in the flat white’s is not what separates it from a latte or cappuccino. The result is very much like a latte or a cappuccino and some even contest the question of whether there is even any difference between these types of drink.